The book of Ephesians is one of the four prison epistles of Paul, generally accepted to be written by him during his imprisonment in Rome – more than once Paul refers to his status as a prisoner in the book [Eph 3:1, 4:1]. The Church of Ephesus is rather well recorded in the Bible – Paul first came into contact with the city at the end of his second missionary trip [Acts 18:19] and later stayed there for 3 years [Acts 20:31]. In fact, outside the ministry of Paul, the Church of Ephesus was also mentioned in John‘s epistles – the Book of Revelation – when the seven churches were addressed [Rev 2:1-7]. As a result, we do know quite a bit about the Church of Ephesus – though it is notable that the writing style of the book of Ephesians may seem more general than the other Pauline epistles which were very localized. Perhaps it is because thebook of Ephesians touches largely on the great topic of the Church and the fullness of Christ, and the believers’ riches in Christ – topics which are really universal regardless of time and space. In this verse, we are reminded that we belong to God. We were created by him. For his purpose – to do good works. I like the word ‘workmanship’. It’s such a word that we probably wouldn’t use in our lives, yet it represents all those words that we often use to replace it. God made us. We are his makings. He is our maker. Not merely as creatures that were created by Him, but also as the new creation as expressed by Paul [2 Corinthians 5:17|Article]. Have you created anything before? An art piece, perhaps? A sculpture? I’m a design student, and I’ve made plenty of art pieces in various mediums. I’d like to offer you some connotations of being the maker of something, from my point of view. At times my professors would question me, isn’t that piece more suited for doing something else? For example, a piece of cloth with a design handprinted by me. I wanted to make it into a handkerchief, but they thought it would more suitable as a shirt. Perhaps the design printed on it would largely be wasted if made into a handkerchief – but that was what I was looking for in the first place; a stylish design where parts of it were clipped off; forming an unexpected, new design. Instead of just becoming a normal shirt; it has become an extraordinary handkerchief. Had the cloth ‘stood up’ and protested against being cut away and wasted, and insisted on being a shirt instead, it would just be thrown into a pile of other similar looking shirts. It couldn’t protest, of course – thankfully so, but we can. And perhaps, we often protest too much. The creator often has ideas in his head that others will simply be unable to fathom [Isaiah 55:8]. It is extremely hard not to be attached to what you create. You spent time, effort, plenty of thoughts, and of course, money on the things you made. You are proud of it, even if you know it is lacking. You like it, even if it’s not as pretty as those made by the factories. That splotch of wild paint at the corner makes the piece unique, even if it is proof of its imperfection. This sense of attachment has caused me a lot of space at home, where rolls and rolls of drawings and paintings are kept – most of them really ugly – blocks and blocks of mockups and models are lying around everywhere. On my wall hangs several masks that I’ve made from scratch and painted – today they’re merely collecting dust. I should throw them away, but I always tell my mother – I’ll throw them next year. The artist loves his artwork, even if he is often most critical of his own art. God loves us, even if he’s often strict with us. God loves us, and will not throw us away [John 6:37]. How many colours did you use in this painting? How tall is the model? How heavy it is? Will it fit into the boot of your car? Will it break if I keep it in my bag? Is it suitable being displayed in an area where there’s direct sunlight? As the one who made the piece of art, the artist would be able to easily answer such questions. There’s nobody who knows the artwork better than the artist. There’s nobody who knows the creation better than the Creator. There’s nobody who knows us better than God. He even knows the number of hairs on our head! [Matthew 10:30]. When we are made to become a new creation, we are therefore created in Christ, becoming a Christian, where the principles of grace will be in us, and we will be in a capacity to perform good works. We should lead a holy, Christ-like life. We should do good, because we were made by He who is good. God has prepared in advanced the good works for us to do – in other words, we, as his creations, were meant to be holy, we were meant to lead a holy life and do good in the first place. 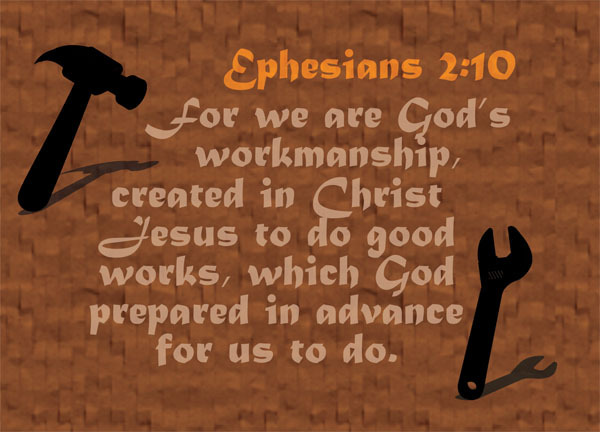 We are God’s workmanship. When God created man, he said ‘very good’. Really, that’s all we need to hold on to, don’t we? God created us, and made us good. He prepared good works for us in advance. He knows us. He loves us. A human artist or inventor may one day throw away all his art pieces. But not God.